Third Grade Academy participants recently at Reid Health. The best time to learn about good nutrition is at an early age when taste buds are still changing and when it is easier to make a lasting impression. The Reid Health Diabetes & Nutrition Education team -- through various classes, programs and outreach -- spends time with all ages in their efforts to help people make better choices with their eating. “It is important to begin nutrition education at an early age while children are impressionable,” said Christie Ferriell, Registered Dietitian and Manager, Diabetes & Nutrition Education & Clinical Nutrition. She said her department does that in various ways, including recent participation in the Third Grade Academy, one-on-one sessions with patients, community outreach and an assortment of classes. Mini nutrition education sessions were given to participants while they were having breakfast in the Reid Café at Twelve Hundred during the recent Third Grade Academy. “We hope that these children will take this information home to share with their families, and that it begins to have an impact on the choices they make when eating snacks and meals,” Ferriell said. Fun activities are added -- especially in programs targeting kids, Ferriell said. In an outreach in March at Seton schools, Pre-K through second grade students were given a nutrition lesson to kick off activities. 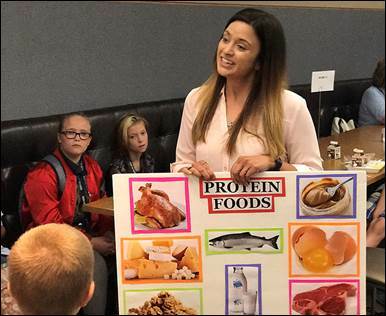 A dietetic intern visited the students twice a week to present a trivia question, show food models, share information about sugar and illustrate sugar content hidden in snacks. Ferriell said parents are often surprised when they learn just how much sugar is in many of the snack options available to their kids. “Many breakfast and snack options have excessive amounts of sugar,” she said. Another challenge is portion sizes, she said, noting that today’s typical serving sizes in the United States are often much larger than recommended. And aside from all the nutritional benefits of some foods over others, one bottom line remains the same for maintaining a healthy weight – if you consume more calories than you burn, weight gain is the result. For more information contact Reid Health Diabetes & Nutrition Education at (765) 983-3423.